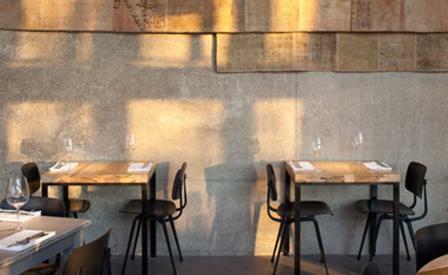 The chef who put contemporary Israeli cuisine on the map has opened a new Tel Aviv restaurant. Star chef Haim Cohen’s fresh, inventive way with Jewish, Kurdish, Turkish and even French flavors means a menu of simple yet original dishes like dalal calamari with seared fennel and caramelized tabun, chopped salad with sardines and Parmesan, and veal sweetbreads with yellow polenta sauce. Israeli architects Baranowitz Kronenberg designed the raw space in concrete, the walls decorated with patchwork Turkish carpets telling the story of old Jaffa. Tall wood shutters reduces the intense Middle Eastern light that seeps through floor-to-ceiling windows and hits the scrapwood chairs and tables by Dutch designer Piet Hein Eek. There’s the odd vintage find as well, like rustic grey lamps from the Czech Republic.